Following the Nintendo Switch’s announcement, many incorrectly predicted that the new console would overtake the Nintendo 3DS. Nintendo is driving this point home with the release of a brand new Pikachu Yellow Edition New Nintendo 3DS XL, scheduled for release on February 24. 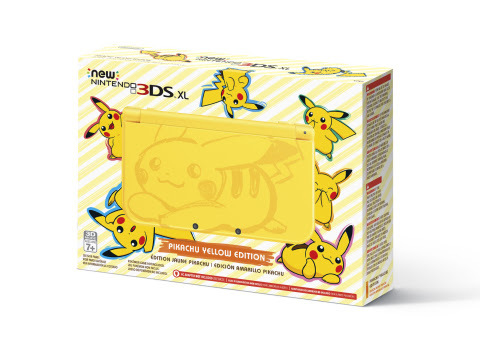 The new 3DS is a cheery Pikachu yellow with a drawing of Pikachu on the cover in a darker yellow and it will be sold at the retail price of $199.99. It’s pretty adorable, especially since it features Pikachu so prominently, but you’ll be able to play a whole new host of 3DS titles on it as they release as well, such as the upcoming Poochy & Yoshi’s Woolly World, Mario Sports Superstars, Pikmin for Nintendo 3DS and more. It’s going to be a fairly expensive couple of months for Nintendo fans, especially with the Nintendo Switch launching on March 3 for a retail price of $299.99. If you want to stock up on all the latest Nintendo products, you might want to start saving those Rupees now so you’re not running into a financial crisis later.